The south side. Restoration began under Ludwig Ross in 1834, shortly after Prince Otto of Bavaria had been imported as independent Greece's new king. 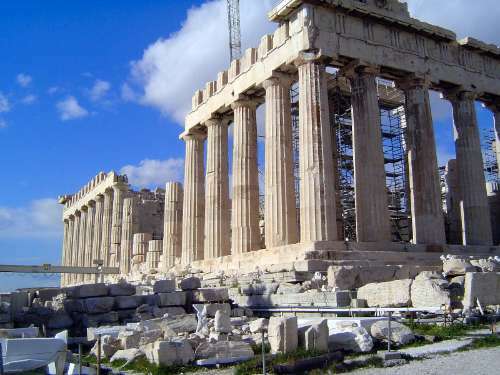 There were plans to build him a palace next to the Parthenon. Instead, the palace was built down below, on what is now Syntagma Square, and the Acropolis became an official monument. In a speech on the occasion, the architect Leo von Klenze said, "The remains of barbarity will be removed, here as in all Greece, and the remains of the glorious past will be brought in new light, as the solid foundation of a glorious present and future." (Beard, p. 100.) The newly founded Greek Archaeological Service went to work. What you see here is largely the work of Nikalaos Balanos, the chief engineer of that Service in the 1920s. In 1986, however, archaeologists began taking apart and reassembling what Balanos had put together, partly because he assembled blocks so long as they fit, regardless of whether they came from the same column; he also inserted iron rods whose rusting expansion threatened to split the columns, which are now being reassembled with titanium.